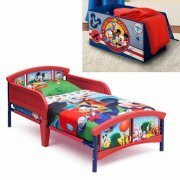 Featuring colorful graphics, this sturdy bed is outfitted with two side rails for your child's safety. The Collapsible Storage Trunk makes a perfect addition to your kid's room. The storage trunk is an easy way to maintain clutter while adding a playful accent. Your little one will love to put away all their toys, books and more in this spacious storage trunk. This Collapsible Storage Trunk is made of a soft canvas material, so you never have to worry about the lid slamming down. The Collapsible Storage Trunk also collapses and folds flat for easy storage when not in use. If you have any questions about this product by DeltaToddler, contact us by completing and submitting the form below. If you are looking for a specif part number, please include it with your message.